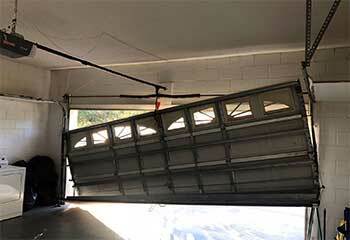 For service or maintenance on your garage door, our quick-response team is ready to come to your rescue. Scroll down to look over some of our most recent projects and you'll understand why local customers agree we're number one for friendly, professional service. Customer Issue: This customer’s track was badly warped and malfunctioning because of it. 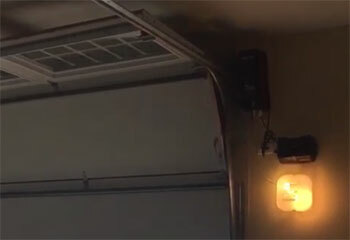 Our Solution: Once the garage door was safely removed and out of the way, our experts made note of exactly where the original track was to ensure that there would be no inconsistencies. The damaged track was then replaced with a new one and the door put back. Customer Issue: Safety sensors were misaligned. 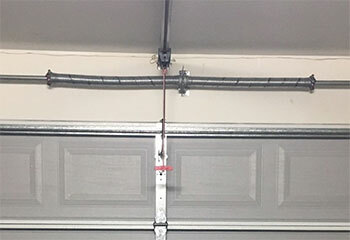 Our Solution: The customer's door reversed each time she tried to close it, and a quickly examination of the safety sensors found that not only were they misaligned, but their wires had detached as well. We reconnected the loose wires and adjusted the photo eyes until they were in complete alignment with each other. 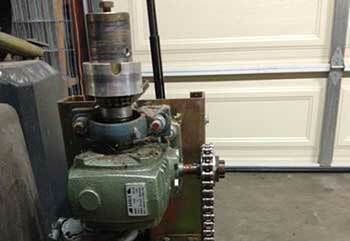 Customer Issue: Opener motor gear broke. Our Solution: Your motor unit is hard at work day in and day out, so it's only natural for some of its components to break down every once in a while. That's what happened to this customer. We replaced his broken gear with a new one and then adjusted his chain drive too to ensure that the unit was operating optimally. Our Solution: Replacing this type of component can be dangerous, so we took extra precautions while adjusting the new unit's tension. We then showed the customer how to lubricate his new torsion spring and how to test the door's balance in order to know when some additional adjustment may be needed.